I see Christopher Snowdon (my opponent in a recent drugs debate) has done some excellent work on the growing interdependence between government and charities. For all that we clashed quite bitterly over drugs, I think Mr Snowdon should be complimented on this. 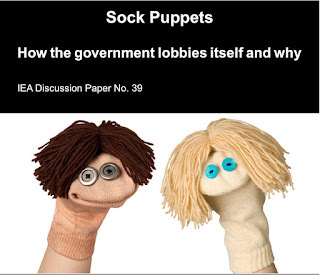 The paper is Sock Puppets: How the government lobbies itself and why. It is a study of state-funded activism with a particular eye on those charities who lobby the government whilst in receipt of government money. I did several radio interviews yesterday and was repeatedly met with shock when I told them that 27,000 British charities rely on the state for more than three-quarters of their income. Perhaps I am not supposed to disclose such things, but even the researcher who sounded me out for the Today programme was surprised to hear that charities received any money at all from the state. In fact, the government gives charities around £13 billion a year—more than they receive in donations from individuals. With such an imbalance between private and public 'giving', the term 'voluntary sector' seems wholly inappropriate and that's before we even touch on the sector's rampant politicisation. But most of these organisations were indulging in little more than flat-out lobbying. And they were using our money to do it. This is not the kind of activity that should be taking place in a free and open society. A country in which the government's putative critics are funded by the government has more than a whiff of totalitarianism about it. What kind of state pays people to campaign for or against the government? What kind of politician thinks it appropriate to use public money to fund activism? Naturally, the grant-addicted charity sector has responded to the IEA paper with displeasure (see here and here), but their rebuttals only highlight their belief that they have a divine right to taxpayer loot merely because (in their opinion) their causes are worthy. The obvious retort to them is that the schemes of technocrats, bureaucrats and vested interests might not be worthy and that is why people prefer a representative democracy to the managed democracy that the sock-puppet system would leave us with. A large part of the charitable sector is so used to being funded by the state that it simply cannot understand why anyone would regard such an arrangement as unseemly. The original meaning of charity seems to have been consigned to the past for much of the 'third sector'. Amongst the public, however, there is still a strong sense that charity is nothing if it is not freely given. If this report does no more than alert people to the scale of government funding of quasi-charities, it will have done some good. Download it here (it's free) and stick it on your laptop, iPad, Kindle or what have you and tell me what you think. The report was covered by the Telegraph and the Daily Mail and there is also some nice mentions from Ed West at the Telegraph, Bishop Hill, Phil Taylor, Guido Fawkes, the TPA, the aforementioned Devil's Kitchen, as well as my IEA colleagues Ruth Porter and Mark Littlewood. I also wrote a couple of short pieces for the IEA and Conservative Home. I was slightly sleepy on BBC Radio 4's Today programme (9 minutes in), but woke up for BBC Humberside (35 minutes in) and was bright and breezy for LBC (there's a podcast of some sort but it requires more effort than I can muster, which is a shame because it was the best one). Well done, Chris. A scandal brewing? Since I probably haven't told this story on this site, let me recount what happened to us on a visit to Oxford a decade ago. We sat down outside a coffee shop that was next door to Oxfam HQ. At a nearby table was a Big Banana from that organisation, and various young underlings who were sucking up to him. The remarks that that company greeted with most evident pleasure were those mocking the volunteers - the nice women (largely) who staff the shops and thereby actually act charitably. The paid staff clearly despised them. We cancelled our regular contribution to a charity which, on reflection, we decided was probably infected by a similar disease. Very informative. Thanks for the explanation of why a change in the rules in 2008 enables charities to now campaign for changes in Government policy. Good stuff, keep up the good work. In fairness, the first person who really opened my eyes to this was Devil's Kitchen, back in 2007 or so. At the time, the accounts which charities filed with Charities Commission gleefully boasted about how much money they got from the government. They are a bit more opaque about it nowadays, possibly because they receive less money from the government but probably because they now that spoilsports like you or DK or me will come along and gleefully point out that they are largely taxpayer funded. Chris, how do you get someone in Australia (e.g., Taxpayers’ Alliance) to look at the same phenomenon in that country? How do you do, Chris. I read the posts on the two sites which you mentioned. The first had no comments, but the second had two from Sir This and Sir That. Neither seem to have actually read your report. I left a comment there. The one issue that I have with your report is that you only just touch upon the the reason that government funds organisations such as ASH. It is a fact that Ministers have very little personal knowledge of their remit (eg, Health Dept). Therefore, they can only act on advice. By funding organisations like ASH, they create the advice and control the advice. That is very objectionable. Of course, the Ministers are not themselves capable of working that out. They rely upon the advice of ASH ET AL! One other 'solution' (regarding your final chapter) would be to require that any 'charity' which requests or is granted taxpayer funds becomes immediately, by virtue of the request itself, open to FoI enquiries. Would that be too much to ask? I think not. After all, "If you have nothing to hide......."
I do find it a little suspect that the tobacco sales spam bots are so clever that they can pick out blogs related to fighting the tobacco control industry. And at around the same time that Frank Davis's blogs have been hacked. "Totally screw you, and absolutely everything you stand for, you filth!" Clearly not a spam bot. Sock Puppets,I smell a new movie in the works! Id coin the phrase and its menaing Chris before some movie producer does! I was drinking tonight, well I'll be honest, I am drinking tonight, and something occurred to me and I thought I'd put in a request to Snowdon. Love your blog, check the blog each week, and here is my request. 'standard drinks', are something plastered onto the bottles in Australia where I am writing from, and I wondered, obviously some public healthists came up with this concept, but was there any historical approximate 'drink' size ever? I'm almost out of 'standard drinks' tonight, and the shops are closed. I felt myself thinking, even though these public healthists tell me I have 3 standard drinks left, I bet I only have two or something. Two real glasses, two drinks that 'I' would consider worthy of being called 'drinks'. Can you do a blog post on 'standard drinks'? My late husband did some contract IT work for Oxfam and swore he would never give them a penny again. They had luxurious premises, expense accounts, very expensive lunches, none of which was in any way charitable.